If I won’t be careful this supposedly straightforward travel-blog will dissolve in complete chaos in no time as I am making new experiences by the minute, which I feel like sharing. After arriving at the hotel in Son La I went out to buy some Coke (as they did not have any in the mini-bar). Obligatory for my nightly Cuba Libre (I bought two bottles of Bacardi in Hanoi last night). To a small around the corner shop bar with an owner inviting me to come again, maybe in the morning for some real coffee. After finishing my last blog entry I left the hotel again with the intention of going to the night market. But I felt neither hungry nor in a shopping mood. So I went back to “my” place for a beer, as the lady did not charge me the “foreigner price” for the Coke earlier. 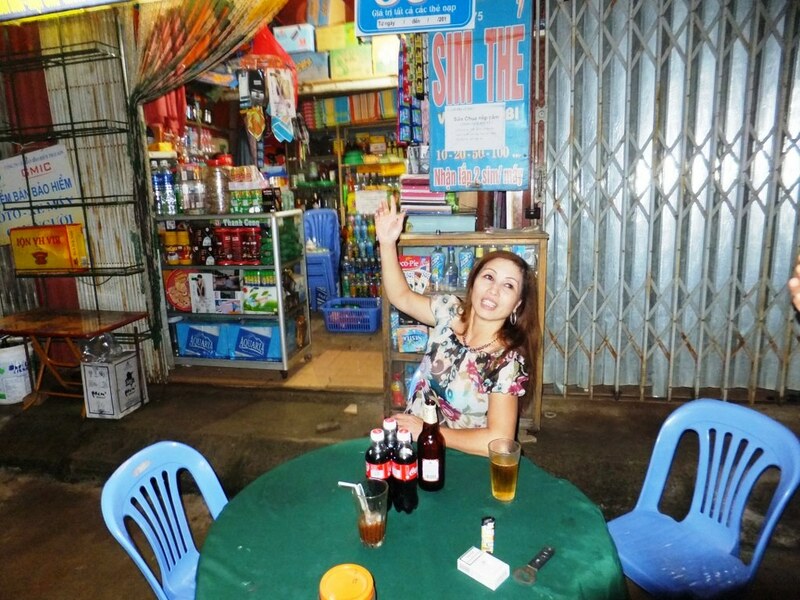 We carried on a very interesting and intense conversation while I was having my Hanoi beer, having about three words in common Still (and I don’t know how), I understood that she is divorced having one grown up son. He showed up too (in some kind of uniform shirt) but I did not understand if he was in the police or some other government agency. Our main point of connecting was my package of Bulgarian cigarettes which immediately made her utter the words CCCP What can I say? Thank you, Russia, for connecting people?! It reminded me another time how important communication is in life! Without it we are amoebae! While she had no problem leaning her knee against mine under the table we could not make much more progress. Maybe because I was not looking for it? For me it’s wonderful to meet new people. OK, women too But I have spent the last 30 or so years with mainly two women and my mind is still not free for any kind of new relationship – and, maybe sadly (maybe not), I am beyond the “butterfly years”. Having said that, I greatly admire Vietnamese women. They are the toughest cookies in this part of Asia. As strong (or maybe even stronger) than the black women I encountered during my life in New York in 1979. Being obliged to hold the family and life together (as most of their men are not very reliable). And they seem to do it with much more strength and devotion than women from other countries or continents I have been to. I have great respect for them. This whole trip is a great lesson in understanding people more. Vietnam is truly different from the other countries in this area. And it’s absolutely no surprise to me that neither the French nor the Americans could break their spirit or make them surrender. Maybe there is a reason why they used to call the Vietnamese the “Prussians” of Asia. But this, of course, is only an impression from Northern Vietnam. Because the Northern people consider the Southern people easy going and irresponsible, not thinking about tomorrow, just enjoying life and spending their money as it comes in. So, maybe, I will have an even better time there? Who knows?! Travelling progress will tell! In any case, I am always open to new experiences and keen on listening to the pulse of local life. Dieser Eintrag wurde veröffentlicht in Frank on the Road, Vietnam von Frank. Permanenter Link des Eintrags. here you are, dear Bullo! What a nice Lady in a interesting scenario. Do you know the saying: ” the best way to learn foreign languages is to have a love affaire..” go for it – you will get even more deeper in vietnamese-understanding ) take care and go on writing! !